CORVALLIS — Oregon State baseball moves on without Pat Casey — and at a pretty nifty pace, at that. 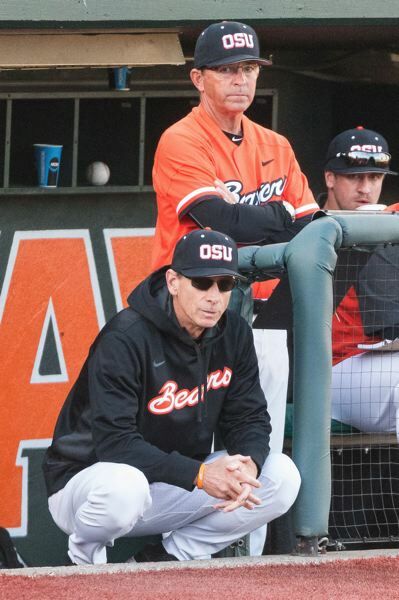 The man who coached the Beavers to three College World Series — the latest coming this past June — has retired (at least for now), giving way to longtime associate head coach Pat Bailey on an interim basis. Bailey, pitching coach Nate Yeskie, third-base coach Andy Jenkins and returnees from Oregon State's 2018 national championship squad have been practicing since Sept. 11. They will get in 30 practices by the time fall ball winds up on Oct. 25. The Beavers have two remaining scheduled scrimmages — against University of British Columbia at Goss Stadium on Oct. 13 and against Sacramento State at Ron Tonkin Field in Hillsboro on Oct. 21. Bailey's message to his players before fall practice was succinct. Bailey: "I tell them, 'When you walk through that gate, it's a commitment to show up for work. Be a laser beam, not a floodlight.' Practices are for players. I've always felt that way. I'm the easiest coach in the world to get along with if you show up every day and work hard and make the most of your talent. If you don't, we're going to have issues." Bailey is surrounded by familiar faces. Yeskie returns for his 10th season as pitching coach. Jenkins, who served six years as a volunteer coach, has been elevated to a paid position. Former Beavers infielder Ryan Gipson, who coached Linn-Benton Community College to a 42-4 record last season, comes on in a volunteer basis. Bailey will continue to work with outfielders. Jenkins is in charge of catching and infield play. Gipson will help with the infielders and coach first base. Ryan Gorton and Bill Rowe return as undergraduate assistants, and Parker Berberet joins him. Jenkins, Gipson, Gorton, Rowe and Berberet all played for Casey at Oregon State. "It's a great staff, like extended family," Bailey says. "I'm fortunate to have these guys around me." Bailey and Yeskie have worked in cohesion for a decade. The dynamics will change with Casey no longer calling the shots, "but we got a chance for an appetizer when 'Case' was dismissed (via suspension) for four games last season," Yeskie says. The Beavers went 4-0 in those games — one against Cal State Fullerton and three against California. "(Bailey) and I both take on more responsibility now," Yeskie says, "but we have a good relationship. Our in-game discussions are productive." Gone from last year's lineup are the likes of Nick Madrigal, Trevor Larnach, Cadyn Grenier, Steven Kwan and Michael Gretler along with ace left-hander Luke Heimlich. Back are catcher Adley Rutschman, the 2018 MVP Award winner in Omaha, slugger Tyler Malone and a deep stable of pitching along with some newcomers who should help plug gaps in 2019. "There is a lot of talent people don't know about, but we do," says pitcher Kevin Abel, who won a CWS-record four games in June. "It's going to be fun to watch. Get your tickets now." Bailey, Casey's right-hand man for 11 seasons, has a good handle on what he has coming back. "Our strength is going to be our pitching staff," Bailey says. "If you have a choice between losing position players or pitchers, I'll take (losing) position players any day of the week. You win with pitching. Pitching and defense win games, and offense determines by how much." Oregon State's 2018 club "was the best offensive team we've had since I've been here," Bailey says. The Beavers led the nation in doubles (151), were third in batting average (.321) and swatted a school-record 67 home runs. Those numbers surely won't be matched by the 2019 team. Yeskie says his pitchers will carry a heavier burden next spring. "We're not going to be insulated and protected by an offense like we were last year," he says. "The ability is there. At some point, hitters have to hit, defenders have to defend and pitchers have to pitch. I like the potential (of the pitching staff), but potential is a word used to get people excited. It doesn't count until they go out there and do it between those white lines." Bailey says the Beavers' offensive style will be different. "We have good team speed," he says. "We have some guys who can really run. Our emphasis this fall is on the short-game stuff — and not just bunting with our speed guys. We'll have to start runners more in terms of run-and-hit, hit-and-run and straight steals. I agree with 'Case' on this: Your most valuable possession is your 27 outs. We're not going to give up outs. We'll apply pressure in different ways than we did a year ago." The only returning position players are Rutschman and senior first baseman Zak Taylor. Malone, a junior who hit eight home runs — including a five-game streak during the regular season, then three at Omaha — was a designated hitter last season. He will play right field. "It's going to help Tyler to use his athleticism in the outfield," Bailey says. Andy Armstrong, who filled in at second base when Madrigal was out with a broken hand for 26 games last season, could be a fixture there this season. "If Andy could hit .280 and play the defense he played last season, we'd be happy with that," Bailey says. The likely replacement for Grenier at shortstop is Beau Philip. The 6-foot, 190-pound junior transfer from San Joaquin Delta JC in Stockton, California, hit .354 with a .463 on-base percentage, 18 doubles, 10 homers, 47 RBIs and 30 stolen bases for a team that went 43-9 and won the state championship last season. "Beau is athletic, with a live body," Bailey says. "He does things easily. He has a chance to hit between five and 10 home runs for us." The third baseman could be Jake Dukart, the freshman from Lake Oswego who spent the summer and early fall as a quarterback on the OSU football team. Now that he has devoted himself to baseball full-time, Dukart will be a contributor right away on the diamond, playing somewhere in the infield. "He's talented," Bailey says. "He's going to be a really good baseball player." OSU coaches are also taking a look at freshmen infielders Jake Harvey from Kennewick, Washington, Wade Mecker from Yorba Linda, California, and Matthew Gretler from Bonney Lake, Washington, the latter the brother of Michael Gretler. "We're really deep in the infield," Bailey says. Three players seem to be the most likely candidates to start in left and center field — junior Preston Jones and sophomores Joe Casey and Kyler McMahon, the latter converted from the infield. Other possibilities are sophomores Alex McGarry, who also plays first base, and Elliot Willy. The latter hit a home run and made a great catch against the fence in right field in an Oct. 6 scrimmage. Rutschman and sophomore Troy Claunch — who hit .321 in 28 at-bats last season — man the catching spots. Claunch, who has missed the fall with a hernia, will likely catch a game during most weekend series and fill the DH role at times next season. "Adley may be the best player in the country," Bailey says. "His throwing during recent scrimmages has been crazy. He's the best catcher I've been around at Oregon State, and we've had some amazing catchers come through here. "Troy would catch for anybody in the country but us. He's a real talent." Abel, senior Bryce Fehmel and junior Jake Mulholland have been shut down by Yeskie this fall to allow for additional rest and recuperation after a long 2018 season. Abel (8-1 last season) and Fehmel (10-1) are ticketed for starting duty next year. Mulholland, who had 16 saves as a sophomore, probably will return to his closer role. The third weekend starter spot is up for grabs, with candidates including juniors Grant Gambrell and Brandon Eisert, sophomore Christian Chamberlain and 6-7 freshman Jake Pfennigs of Post Falls, Idaho. Another possibility would be freshman Andrew Walling, a left-hander from Longview, Washington, who sat out his senior season after undergoing Tommy John elbow surgery. Walling will miss the fall but could be a factor once he returns to full-time duty in February. The bullpen is loaded with veteran arms, including sophomores Mitchell Verburg and Nathan Burns and seniors Sam Tweedt and Jordan Britton.